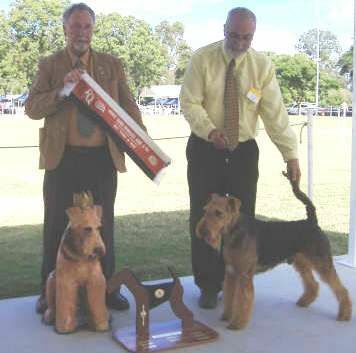 Sonny gained his title in the most spectacular fashion when under Airedale Specialist judge, Dr. John Collard (Larnook Airedales), he was chosen Best in Specialty Show at the Airedale Enthusiasts Championship Show in Brisbane in May 2009. Sonny has the most impeccable breeding with his father being the world famous and top winning Airedale Ever. Ch Evermay's High Performance (Max) His mother Ch Tjuringa Queen Bee is certainly one of Australia's all time top producing Airedales having been mum to Ch Tjuringa Firecracker and Tjuringa Moulten Iron also both Best In Show winners. Sonny is available at stud together with his spectacular brother Ch Tjuringa Romper Stomper.